Cook the pasta according to packet instructions, stirring regularly. Meanwhile, prepare your vegetables. Trim the asparagus stalks then peel the lower end of each stalk before cutting into slices, roughly the same size as the broad beans. Keep the tips whole. Put the olive oil in a saucepan over a low heat. Add the garlic and celery and gently sauté for 3 minutes. 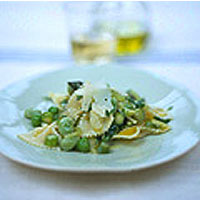 Then stir in the salad onions, asparagus slices and tips, peas and broad beans, fry for 3 minutes before adding a spoonful or two of water or stock. Simmer for 5 minutes or until tender, then add the lovage or thyme, season and toss in the cooked and drained pasta.